If Katie Sonntag, 17, and Leah Marino, 16, were to hear “you hit like a girl,” that would be a big compliment in the world of sports. These are no ordinary teenagers playing hockey. The local girls, who grew up and practiced their skills at the South Lake Tahoe Ice Arena, each scored Division 1 NCAA scholarships to play hockey back East. First, South Lake Tahoe is the land of skiers and boarders. Second, it’s quite an achievement for anyone wanting to play a higher level of sports. Third, they’re girls – unheard of to expect in most towns. When she’s done with high school, Marino will accept a full-ride scholarship at Robert Morris University in Pittsburgh – the home state of her parents. Sonntag will attend Union College in Schenectady, N.Y. – one state over from Vermont where she was born and 45 minutes from relatives. Their parents sometimes joke about whether they should have just stayed where they were given their daughters’ inevitable return to the East to achieve their hockey goals. After all, the duo has found it necessary to attend hockey academies in far flung places to be seen and hone their skill sets. 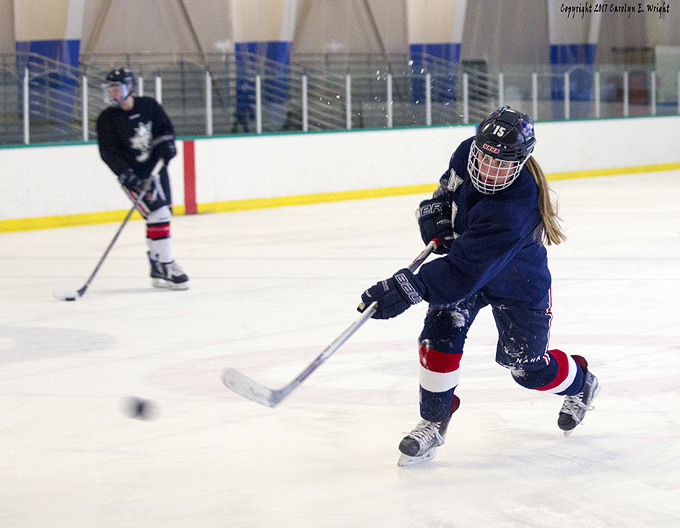 Sonntag attends the Pursuit of Excellence hockey school in Kelowna, B.C., between her studies. Marino plans to spend six months at the North American Hockey Academy in Stowe, Vt.
“She can get more ice time there. 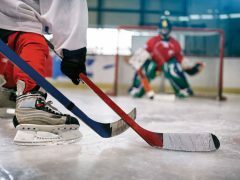 Girls hockey is not a sport that’s readily available (at venues),” Leah’s father, Jim Marino, said, while joining his daughter on the ice at the South Lake Tahoe rink. He recalled how his family would make eight- to 10-hour round trips to San Jose from September to June to nurture his daughter’s hockey passion. The two girls hit the ice last month when they came home for a break. It’s a good, familiar place to unwind as a family, given Marino coached hockey and Katie’s dad, Pete Sonntag, plays hockey when he’s not running Heavenly Mountain Resort. If not for their family moves to Lake Tahoe, perhaps the two girls wouldn’t have met — gaining a friendship as solid as the puck they slap. One could argue the teens’ achievements involve a destiny built on lifelong dreams of going to college and playing hockey. “I think it was always a ‘what if.’ There are a lot of girls who would just stop (playing). We both knew what we wanted and pushed each other toward it,” Marino told Lake Tahoe News. And there lies the dynamics of women in sport. “It’s always been a dream of ours to play hockey,” Sonntag said. Sonntag would also like to major in physics; Marino in sports medicine. Sonntag has a head start with the physics of manipulating a hard round object on a slick surface. She picked up the puck, tapped it a few times, then slapped it for fun at the glass barrier square in front of her father watching across the rink. It was a thing of beauty. The two girls glided on the ice, practicing drills with an uncanny natural ability. Being on this oval was like being on their home ice. As it should have been. Marino and Sonntag have spent many long hours through their childhoods at that ice arena, giving up traditional teenage girls’ pursuits along the way. Boys make up one of those pastimes. “It’ll be my first time at prom this year,” Marino said. Sonntag admitted to never having attended a school dance and essentially skipped the high school football games. The two girls began skating at about age 7 and started playing hockey shortly thereafter. When the Sonntags moved to Tahoe with Katie, Marino – a winger – was the only girl competing in the six various hockey leagues at the rink, she recalled. It was meant to be the duo would become close, supportive friends. Hockey isn’t necessarily a girls’ sport, so when Sonntag, a longtime center, excelled to becoming a captain of one of the leagues the boys weren’t thrilled. “Now they look up to us,” Marino added of gaining the collegiate honor. Sonntag hopes the boys they know won’t be the only ones looking up to the groundbreaking females. They’re the first from Tahoe to seize the D1 scholarships for the sport. “Where we come from (in the Northeast), it’s not as big a deal, but it’s pretty crazy here,” Marino said. Both girls want to be inspirational to young girls everywhere in pursuit of their dreams. “I’d like them to know they can make it and can move away from home to get it,” Marino said. So maybe it takes a little brush with humility mixed with the drive to succeed to be a winner. To achieve a D1 NCAA college scholarship, a student must maintain at least a 3.0 grade point average and undergo a strict protocol in the recruitment process. Among the three NCAA categories, Division 1 schools generally have the biggest student bodies, manage the largest athletic budgets and offer the most generous number of scholarships. With nearly 350 colleges and universities in its membership, Division 1 schools field more than 6,000 athletic teams, providing opportunities for more than 170,000 student-athletes to compete in NCAA sports each year. Getting there is no easy accomplishment. It takes a lot of hard work, talent and dedication. “It’s incredible what they have accomplished. It’s just nearly impossible to get there – NCAA D1. Think about it, only 35 Division 1 women’s teams, say 27 players per team, some 945 spots total. Of all the women hockey players across both the U.S. and Canada, Tahoe girls take two of them. From our small town, well, that’s the stuff of fiction,” Van Oleson, who owns Tahoe Sports and Entertainment, told Lake Tahoe News. The company operates the ice arena, so an emotionally-charged Oleson has watched Marino and Sonntag for years. “These girls are pioneers, groundbreakers (who) have paved a way and made it clear what a girl from Tahoe can do,” Oleson said. Thank you to www.laketahoenews.net for letting us share their article.